The phone call was surprising; the interview was a treat, but … what was it Chris Mathews said about Obama giving him a tingle up his leg, or some similar such nonsense? … When I asked Madeleine Stowe [#Revenge] for a promo shot to accompany her interview on the web site, she did me one better – or, 3, actually – and sent me her very first “selfies” … now, THAT was a tingle!! This interview with Madeleine Stowe was done on Good Friday, March 25, 2005. It came about as a complete surprise, Madeleine contacting us after she read our THE WORLD OF SOLDIER #2 pages, certainly not for the purpose of giving an interview! [See: Cora’s Coming Out posting on our MOHICAN BOARD] We corresponded for a bit, chatted on the phone one day, and the interview was born! Funny how things can turn around! Enjoy! Mohican Press: First of all, what brought you around to our Mohicans web site so long after the fact? Madeleine Stowe: It seems I saw your web site several years ago, but because I never used a computer (although I had one) until very recently, I never did much Internet investigation. It’s always uncomfortable to read things about oneself, I suppose. 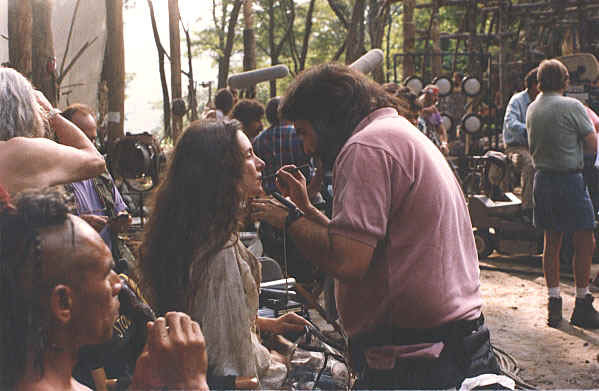 Prior to The Last of the Mohicans, you were in The Two Jakes, Revenge, Stakeout and a few other films. How did you come to land the role of a leading lady next to Academy Award winner, Daniel Day-Lewis? My agent, David Schiff, forced me to read Michael Mann’s screenplay. While upon reading it once, I thought it was a nice action picture, I didn’t feel any particular affinity for either Cora nor the story. David kept nagging me, saying that he fully believed in the project. I read it twice more, then finally sat down with Michael to discuss the film. Michael is a funny character, for whom I have a great deal of affection. He sat across his desk and seemed to be a bit of a blunt fellow. We began talking about the characters and he opened up about his vision. He’s extremely thoughtful and sees grand issues both social and political in an interesting way. Quite honestly, I wasn’t certain how some of his ideas were applicable to the screenplay, but he was heartfelt and adamant about them. And I remember completely going with it. After a week or so he asked me to come and read with Daniel and Steve Waddington. I remember Eric sitting in the outer office. He was a striking and interesting young man and someone was asking him if it was appropriate to say “Native American” when referring to his people and he said, “No. Indian”. The reading was simple, and Michael was very specific with his direction (he chose the scene where Hawkeye tells Cora about his background). I remember nearly having a fit of the giggles during the reading because dear Daniel was SO respectful and serious and I was finding the whole situation funny because I was speaking to his profile. And I thought what an interesting choice Waddington was for Duncan. Such a complete surprise to me. While I didn’t know it at the time, Daniel had suggested to Michael that I play Cora before we had ever met. And prior to our meeting, I was at a restaurant with John Bailey, the director, when I felt this man looking over in our direction and smiling a good deal. I realized, after leaving, that it was Daniel. He later told me that he was having lunch with Michael and had coincidentally asked him earlier that very day about me. It’s just a funny thing, isn’t it? And I was terribly flattered when he told me this tale. He was also very clear that the decision to cast me as Cora was all Michael’s. OK … it is obvious that at some point you did adopt Cora as your own. What may have been the turning point?In the 90’s action pictures were all the rage. As a woman, I was fed up with them and I initially thought that the script was just another action film dressed up as a period piece. When Michael began speaking about the character’s inner life, it was clear that his own inner life was strong, as well. I then saw Cora in a completely different light because of Michael’s orientation. It became easy to personalize her. Working on the accent helped, enormously. I will tell you, though, that when I brought Michael a correct “British” accent, one that my dialect coach was happy with, he hated it. Michael insisted that the accent be less formal and more in keeping with what he called the “rhythms” I had used in my initial reading. Wanting things to be right, I’ve always been troubled by that decision. But Michael also responds to things emotionally and his instincts had to be trusted. You were magnificent as Cora Munro. At one point, long ago, you were quoted as saying that for the first time “I feel like everything I tried to do is in there.” Tell us about the role of Cora, how you tried to portray her, and do you still feel the same? Michael used the preproduction period to study our faces. He’d have me come to rehearsal with my hair up and speak Cora’s words. He’d do a semi-circle and just look at me from every angle. I cannot express how rare it is for a director to do this. I also cannot tell you where my interpretation of Cora began and Michael’s ended. I often times felt as if he were in the scenes with us, such was his imprint. So when I said, “I feel like everything I tried to do is there”, it is less because of what I did than it is a case of Michael keeping his word. Sometimes he’d launch into a discourse, a convoluted discourse about something or other, and I had no idea what he was saying. I’d tease him about it, “What on earth are you talking about?” And he was capable of blushing. I have this recollection of feeling a kind of shock when I arrived in Asheville. The driver who picked me up at the airport told me that an entire hillside had been deforested in order to build the fort. That gave me a bit of a jolt, and I instantly started jumping to all kinds of conclusions (most of which were hostile) about this huge machine which had started rolling. For the first two weeks of filming, I remember bristling at some of the occurrences on the set, none of which directly involved me. Then I surrendered to the environment, to Michael’s method, and became much happier, even though no one knew what to expect on a day-to-day basis. Michael was very specific during rehearsals. When he was pleased, he always had this charming grin. One day, during preproduction he called me into his office. I thought that he was displeased with something and asked him, “What is it?” He said, to my surprise “I just wanted to hang out”. And that was it. I don’t even recall that we had much to say at that point. No, wait, as I remember, I was about to do some additional shooting on another film, and I think he just wanted to be sure that I wouldn’t forget about “Cora”. He let me out of two days of preproduction to fly to Florida to complete my other obligation. There were long wardrobe fittings where Michael would have us hold bolts of fabric up to our bodies. James Acheson is hugely talented and he had the daunting task of assembling his crew to make these period costumes from scratch. And they would do so, perfectly and quickly. Michael would then take us on location and see how the colors worked in the forests and fields. Part of Michael’s uniqueness, I think, comes from the fact that he worked with music. He had a tape which he gave me with many different compositions, really eclectic. These pieces of music were sources of inspiration. One was “The House On Rose Hill”, another was music composed by Daniel Lanois, which Michael ultimately used during the scene in the Glade. The best directors I’ve worked with have always had a strong sense of music and movement. These two things are inseparable. And Michael used them so effectively in LOTM, particularly during the last ten minutes of the film. Sometimes I’ll turn the channel and there’s the movie and I can honestly say that those last few minutes always fascinate me. It’s one of the rare instances when image, music, and drama work effectively. Some of the imagery was inspired by Wyeth’s illustrations. The best of which, I think, is the moment when Magua stands before Chingachgook to accept his death blow. How much, if at all, did Binnie Barnes influence you by her performance as Alice Munro, more or less the Cora-character in Mann’s version, in the 1936 version, starring Randolph Scott? I have not seen the 1936 version. So I’m not at all familiar with Binnie Barnes’ performance. If you see an influence, then you’d have to ask Michael about that. He was both very specific about what he wanted and very accepting of what we gave him. Just a comment – watch the ’36 version. Michael MUST’VE patterned you, at least in part, on Barnes. I think you’ll see what I mean. Perhaps my favorite “Cora Moment” is the “What are you looking at, Sir” segment. Hawkeye replies, “I’m looking at you, Miss.” You do a wonderful job, without a word, of expressing what appears to be a myriad of feelings … What was Cora feeling at that point? With respect to “What are you looking at, Sir?”, again I remember Michael staging the scene in rehearsals. I did something, and he was happy. The moment with Hawkeye is all about mutual attraction, expressed without filter from him, and a surrendering of social guardedness from Cora. She accepts his directness as her own. You are so funny to ask me about “The Look”. I’ve been asked many times, and I really am not sure what anyone means. My friend Margy has always inquired, and most recently, Morton Kondracke and his political analyst associates. I don’t quite get it. You short change yourself. During that sequence, your face conveys so many swirling emotions. Brilliant. Coupled with the music, one can’t help but to sigh after that sequence. Even after as many viewings as I have under my belt. That scene alone ought to have garnered you an Oscar. You know, at one of our Mohican Gatherings, we had an “Oscar” made for Wes Studi – also sadly overlooked by the Academy. He was thrilled! You want one? It could be arranged!Rich, I think you love the movie so much, you’re not being objective! But thank you. You’ve got it backwards, one of the reasons I love the film so much is because of your wonderful performance … see? Cause & effect! The Kiss scene at the fort … the lighting & music and the chemistry between you and Daniel makes for a very subtly powerful romantic interlude. It is extremely tastefully done. Was more shot than what we see? I guess what I’m asking is, did Cora & Hawkeye make love? If there was no footage, what do you think happened there at the fort. Simply a passionate kiss? Or, was there more to it? The Kiss scene was attempted three times. The first was in a peculiar spot of the fort on the ground level. It felt forced to me, and I knew right away that, in spite of what others were saying, it was dead wrong. The next day at work, I went straight to Daniel and told him so, saying something to the effect that “It was my fault”. We told Michael my opinion (and this was unusual), he thought it over, watched dailies (which we were not allowed to see) and came back and said “You’re right”. The scene was attempted a second time, up on top of the fort, and cameras didn’t even roll. Michael, though he wasn’t admitting it, wasn’t sure how to shoot the scene. He also didn’t like a lock of my hair and said that he couldn’t get into the moment without the hair being just right. I quietly knew that he was anxious and that the hairdo wasn’t the real issue. But we all let it go and came back to the scene sometime later. I remember feeling that Michael was extremely sensitive when it came to that moment. Most directors are and they usually rely, at least in my experience, on the actress to take over. And Michael is a gentleman. So Daniel and I simply expressed what we felt was appropriate for the scene and Dante Spinotti had an innate sense of where to place the camera. And as I remembered, he used a hand-held to get a sense of raw beauty. Michael was right there, asking for specific shots from Dante. Everything fell into place and it was a particularly lovely, unforced moment. You ask if Hawkeye and Cora make love—The answer is, that none of us ever felt that to be an answerable question. The emotion, and surrender was what was important to Michael and I believe he used most or all of what we shot. Ok … I ask this question on behalf of many female fans … and with a blushing face … Many are enamored with the male cast in this movie. I think it has to do with breach clouts and the like. I don’t understand. So, you worked with these guys for 5 months. What’s your take? I felt sorry for the men having to wear them. That’s all. Fair enough … You fired a flintlock pistol in the movie. First time? Who trained you? I don’t recall who taught me how to fire the flint-lock, I apologize. We had fantastic crew members like Mickey Pew, the propmaster, who could produce anything Michael asked for with a “Mickey Pew, with you, sir”. There were guys like Chunky Hews in the electrical dept. and Danny Eccleston who would enthrall us with fantastic stories of great English directors and their experiences. They were wild boys grown up. My driver Kellie Frost and I would race these fellows home and they were always faster on the highway. We did the same with Daniel and his driver, and thus began a long series of jokes and competitions to alleviate the impossible hours and tensions this film provoked. Kellie was newly widowed, had grown up around horses all her life, and could hook up a trailer and drive her rig better than any man. She became my very close friend, and I’m godmother to her first-born. Her parents came to run my Texas Ranch and are like grandparents to my daughter, May. No, my daughter wasn’t named after Jodhi. May is just a good old fashioned name which isn’t used anymore. Your sister, played by Jodhi, had a very non-verbal role, leading one to believe she was that way in real-life. Did you and Jodhi form any kind of professional or personal bond during this filming? Jodhi was very young, 16, I think. Highly gifted, and at an age where she may have felt a bit isolated. She was also very bright and it was important that one not speak to her as a child. I remember that she had these lovely eyelids, lovely eyes, and was still on that border of shedding a kind of gawkiness. She’s spectacular on that cliff with Wes. I saw her a year later and she’d completely grown up. The transition was made and she was beguiling. How would you view Alice’s death? Suicide, caused by overwhelming fear, or a brave gesture of defiance toward Magua? Jodhi would have to speak to you about her decision on the cliff. Well, just as a viewer of the film, no thoughts on that? Or, if YOU were playing Alice, what would have been your reason? I would never speculate what I’d do in her situation. Thinking back, it seems that Jodhi’s choice may have been based upon Alice’s deteriorating state of mind and a will to forge her own destiny. Alice, at that point, would not let anyone decide anything for her. And Michael was very pointed in keeping Alice’s British identity intact. While Cora was ready to change with the times, Alice wasn’t,. There would be no future for her without her right to self-determination. This is how I remember it. She wouldn’t surrender her will. But again, you need to ask Jodhi. I can only remember the superficial conversations Michael had. I certainly don’t know what he told her in private. During the final sequence, after Magua’s death, Cora and Hawkeye are seen embracing. The score is all that is heard, and camera angles are such that no one is seen speaking. However, the script called for a marriage proposal from Hawkeye. Watching the film, head shakes and the like make it appear that perhaps there was dialogue & that in the end, Michael Mann scraped it. Was that shot? Yes, the marriage proposal was shot. Michael excluded the dialogue from the final edit. I thought so! Speaking of cuts, rumor has it the original pre-release cut was about 3 hours. Apparently 20th Century Fox insisted on paring away many minutes. Other than what we see on the DVD, can you recall any other scenes that never made it to the big screen? I don’t know how long Michael’s rough cut may have been. It would be typical for most first cuts of a movie of this size to come in at three hours. But I can’t imagine that it would make a good film. I will tell you that 20th had huge doubts about LOTM during the editing and testing process. This went on for months. Audiences were appalled with the violence. There came a point in time when Michael was under a great deal of pressure to alter the film in a way that was just disturbing to him. I had not seen the movie, yet. He phoned me in July of ’92 to look at his version. It was exactly what was released two months later with the exception of a couple of reaction shots which we went back in to get. I liked the movie very much and asked him what the studio’s problem was. I felt that he was at a point where they might have worn him down (if that’s at all possible). I phoned Joe Roth, who was head of the studio at the time, and told him how beautiful the film was, and that I was fully ready to support it, that Michael’s work was wonderful and I imagined that Daniel would feel the same. He listened quietly and read between the lines. What happened after that, I can’t tell you. I know that Michael met with the studio again and drew the line. In any event, Joe Roth was very proud of the film and the studio had a happy ending. Back to the last scene, Russell Means told us that you & the crew hiked in to that location. When I take folks up there, one of the most common questions is, how did you get there? I tell them you walked. They say, “no, helicopter.” OK, once and for all, how did you get the film’s last location, Table Rock Mountain – where Chingachgook gives his soliloquy? The location was very difficult to get to. I recall rock-climbing a good deal of the way in that long skirt, and I felt terrible for the crew members who had to haul the heavy equipment. For some reason, they couldn’t get there by helicopter. I remember the day vividly and how proud Russell felt to be an actor. Something clicked in him as he gave his last speech, and he was so happy. The weather was turning cold and I remember that Dante was using nothing but natural light as his electric department was away, prepping the scene in the cave. We stayed on that rock for the whole day. And of course we descended at nightfall with flashlights. It was treacherous. I think someone was injured. But I did love being there, we all did. Any particular anecdote, or two, from your days on this set that you’d like to share? Again, the extras and crew were courageous with very little given back. They weren’t fed well and that fact always bothered me. I hated seeing them in those heavy red coats in the sweltering heat and I remembered complaining to Hunt Lowry about it. It didn’t seem just to me. But they were spirited and gave their all. Because of the tension and difficulty, I remember trying to do the silliest things when we weren’t rolling cameras, anything to lift the spirits. But once on set, it was important to have full concentration. And I genuinely liked all of the cast members very much. Steve had a wicked sense of humor. I remember Russell coming to my rescue, once. I watched Eric evolve before everyone’s eyes. Maurice loved what he did, so. He treated his character with respect, down to the costuming. Wes was one of the first cast members I remember having a conversation with–such a great face. There were Colm Meany and Pete Posthelwaite–fantastic Brits. There were mornings in the make-up trailer where I’d have fits of laughter because of the extraordinary daily events of the shoot. Sometimes, it was all too much to believe. But the wildest things happened. And Daniel was a wonderful and trustworthy partner. And a fine prankster as well. On the last day of shooting, we were all so exhausted that no one knew what they were doing. After lunch we had our usual make-up touch-ups, only it was Daniel doing my make-up this time. When the AD’s called for us, Daniel replied,” I’m going as fast as I can”. Michael was actually sentimental on the final day, which took me aback. I don’t really recall the Uncas and Alice relationship very well as written. Somewhere , I have the memory of making some kind of joke about “A romance for everyone”, but it seems to me, without reviewing the screenplay that there was to be an attraction that was never acted upon between the two characters. Here’s one you may not know the answer to. As you and Daniel Day-Lewis are hurriedly leaving the Huron Village, you keep looking back, presumably to see what has become of your sister. The camera cuts to an Indian who appears to be watching you. Is there any significance to this fellow? As we were leaving the Huron camp, it was awkward filming. I think that the Huron watching us was there to create tension – maybe we wouldn’t get out. Nothing complicated. This film has caught the imagination of many. There’s something to the story that captures the viewer; an essence that many can identify with on a real and personal level. On a different level perhaps, it seems to have captured those who made the film, as well. It is rare, I would think, that so many involved in the filming return to it with such passion so many years later. Yet, one look at this web site shows that they do to Mohicans. What was so special? What happened there in 1991? What was the magic? The magic that doesn’t die? There came a point in time, with all the difficulty, all the frustration, where I was quite content to be where I was. I suppose one could call it a kind of enchantment, I don’t know. The shoot was so difficult on the crew and the extras. Often, it was unpleasant for them and many left. But difficulty also creates its own kind of beauty, I suppose. And while I don’t revisit it unless asked, there is this sense of apartness I felt during that period of time from our own world. Perhaps the others felt the same, I’m unsure, and that is what you might feel when you watch the movie. We were all so different, temperamentally from one another, it’s impossible to believe that we were together for so long. The cast and crew. How could we be more different from one another? It’s difficult to imagine. But something lovely came of it. And that particular time is very private to me. Interesting … and I think you may have hit the nail on the head. Any of those locations stand above the others in evoking this feeling in you? Have you ever physically revisited any of them? No, I’ve never returned to the locations. I do remember certain days more clearly than others and certain locations with a sense of nostalgia. Perhaps one day, I’ll bring my daughter to see them, if she’s interested. Have you seen the DVD version? If so, what do you think? Michael did send me the DVD. I don’t remember huge differences. The Clannad song was gone. When Michael originally used it, I didn’t care too much for it, then I did an about-face. This from a female friend: … maybe she can settle the ongoing debate as to whether Uncas and Alice were supposed to be in love with each other in the movie, or did MM want to leave that to the interpretation of the audience? I think that it is the latter, but maybe she knows. You can also ask her how the heck she stays so young looking!!! I watched “Saving Milly” and she is as young and beautiful as she was in LOTM!!! After 13 years, she is supposed to age a little!!! Does she have a personal involvement with the fight to find a cure for Parkinson’s disease? If so, is that why she decided to portray Milly Kondracke? Tell her that she did a wonderful job as usual! Please thank your friend for the Saving Milly compliment. I became interested in the project because my own father had a severe neurological disease. Milly was such an unusual woman. And finally, any glimpse you would like to share into future projects you may be working on? At the moment, my producing partner, Michael DeLuca and I are working on The Unbound Captives. This is a period piece set in mid-nineteenth century Texas. It is a romantic, violent epic based upon a difficult time in history. It is my sole focus, the only thing I want to do. Saving Milly was a break from this effort because I felt that it was time to be part of something that could shed light on a disease everyone feels they know, when most know so little. Any idea when this is expected to be released? Who else makes up the cast? What’s your role? Unbound Captives was inspired by a historical events surrounding the Comanche/Texan conflict of the times. We read a great many captive narratives as research. It deals with issues of love, acculturation, memory, fate and redemption. I’m reticent to say much more, but we would like to begin in the coming year. We’d like to shoot through the seasons because of the passage of time. This project is the great love of my life. Thank you, Madeleine … and best of luck in all you do! Well, you see. I only got this cell phone recently as I hate, hate, hate them. But a friend chastised me for not using the camera. So as weird as it feels taking pictures of oneself, I’m just starting to figure it out. So there you have it. Have to admit, it’s kind of fun sending and more fun getting photos of others. Hope you’re well. Say “Hi” to everyone, okay? Madeleine was extremely gracious and open during this process. We had asked her for the interview, promising to keep it brief. She replied, “Feel free to ask anything else that pops into your head. Don’t fret about length or detail. I’ll do my best.” For personal reasons, we elected to keep it on the short side – at least compared to our other cast interviews. It was an honor for us to be able to include Miss Cora Munro’s thoughts on our web site after all this time! She is as lovely to speak with as she is to look at on the big screen! Very flattered that she has chosen to contribute to the web site in this manner! Next Post: The Hussy Bus Cross-Country Adventure!